June 12, 2017 / LBD "Nytetrayn"
At Sony's 2017 Electronic Entertainment Expo (or E3, if you prefer) press conference, the PlayStation brand pulled back the curtain on a brand-new story trailer for their upcoming crossover fighting game, Marvel vs. Capcom: Infinite. Not that since this is a story trailer, there are probably what some would consider spoilers within, including the appearance of another character from the Mega Man franchise. That said, I will tell you that the end has announced that a Story Demo is available now on both the PlayStation 4 and Xbox One. Beyond that, watch and read on at your own risk. Just throwing a little bit of space here, in case you couldn't help but look down even though you really didn't want to. This space is here just to make sure that nothing I type down below pops up on your screen when you didn't want it to. 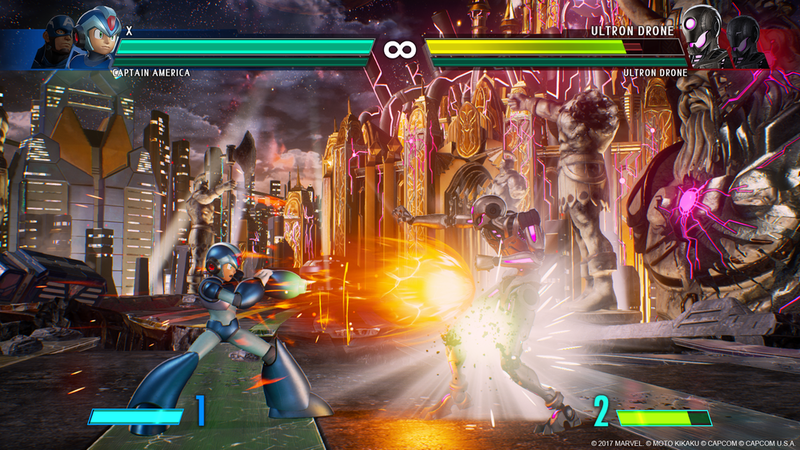 So in addition to a saber-wielding Ultron Sigma, we've got confirmation of Arthur and Dante in the game, among others. But more importantly, we have confirmation that X has a voice! Who it is, I don't know yet, but if you hear anything, feel free to give me a holler. Zero is back, and he's in his Version 2 form. What's more, he's apparently not on our side -- not to start, anyway. And he's not downloadable content as speculated, either, which seems to negate the validity of the rumored list. Oh, and Black Panther is the second character revealed for the Deluxe Edition release. Marvel vs. Capcom: Infinite is scheduled for a September 19th release date, and there are plenty of ways to get it. And if you'd like to see more from Sony's conference, you can view my Top 5 Moments on PoisonMushroom.Org.